Whenever we move to a new city in Brazil, we like to visit the tourist hot spots. We were surprised to discover that the most visited building in Brasília is the Temple of Good Will, an ecumenical religious center just a block from Andrew’s school. 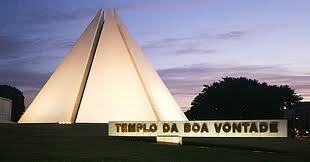 Every year more than a million Brazilians visit the monument, voted one of the “Seven Wonders of Brasília”. The temple was founded in 1989 by José de Paiva Netto who defines it as a place that welcomes “all religions, ethnicities, cultures, and philosophies.” Inside the temple is a wall covered with pictures of men who “have contributed to the progress of humanity.” A drawing of Jesus is in the center. Around it are pictures of Charles Darwin, John Calvin, Charlie Chaplin, John Lennon, and many others. Netto’s messages of goodwill toward all men cite such men as Gandhi, Buddha, John F. Kennedy, Mohammed, Aristotle, and Abraham Lincoln. This mixture of leaders, theologians and philosophers was surprising enough, but to see John Wesley among the other portraits gave us quite a start. A gigantic crystal hangs directly over a black and white spiral pattern on the floor of the temple. Worshippers are encouraged to walk barefoot on the black stripes, following the path inward. When they reach the center they pause to receive positive energy from the crystal. Then they follow the white path of purification back to the edge of the room. It is common in Brazil to hear that all religions lead to heaven, but it isn’t often that you see it being preached this overtly. It breaks our hearts to see people seeking salvation through any other means than faith in Jesus Christ. Pray for us to be bold witnesses of the gospel. The evil one is so deceitful! May God’s power in you defeat him everywhere you go.